Welcome to my third post in my blog series about Daily 5. I hope that you enjoyed my other posts about how to get set up before the year begins and Read to Self. 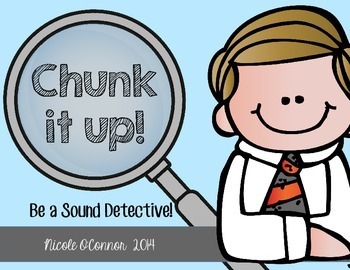 If you missed them, click these links to get caught up - How to Get Started with Daily 5 and Daily 5: Setting students up for Read to Self success. Now, I want to put this out there right away and I said this in my other posts as well, I am in NO way affiliated with "the sisters" or the Daily 5 on any official platform. I think that the sisters are FANTASTIC and I highly recommend buying the most current Daily 5 book. But me? 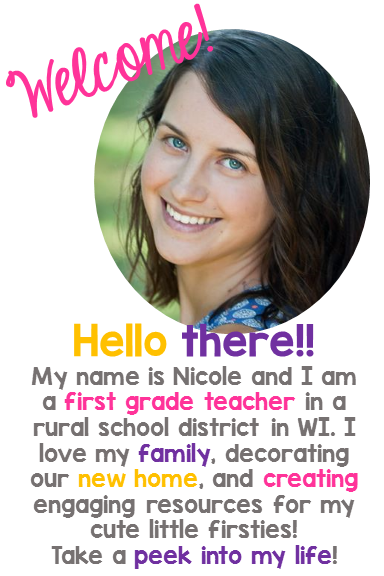 I am simply a first grade teacher who utilizes the Daily 5 framework and I have adapted it to meet my own needs. Okay, today I am writing about my ABSOLUTE FAVORITE part of Daily 5. It is definitely my students' favorite as well. I have ALMOST ZERO behavior/management issues during this Daily 5 round and I attribute that to the interactive (As Fancy Nancy would say.... Interactive is a fancy word for "FUN.") nature of word work. For me, setting up Word Work is much simpler than other rounds of Daily 5, especially in the first few weeks of school. I begin word work on the Monday of the second week of school. I begin by introducing our Word Work I-Chart. After introducing the I-Chart, I like to introduce our first week of spelling words. Our first grade team has developed our own spelling lists, which consist of 7 word family words and 5 sight words each week. 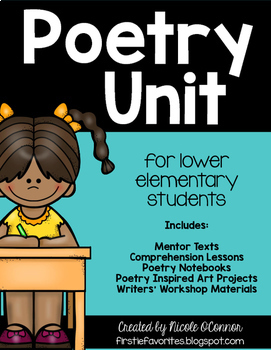 I have them available for FREE on Teachers Pay Teachers if you are interested in grabbing them- each week includes a spelling list to take home, spelling homework, a few practice pages, and a set of word list cards for the classroom. This is 27 weeks of spelling... We do a few review weeks throughout the year or have themed word lists around holidays which are not included in these sets... that's why it's not quite a full school years worth of spelling. 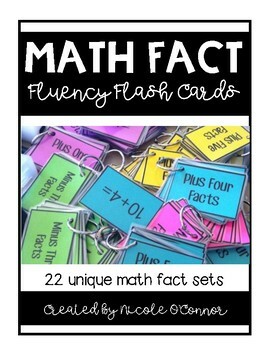 From these sets, I have word cards that my students use during word work (on the left of the photo). 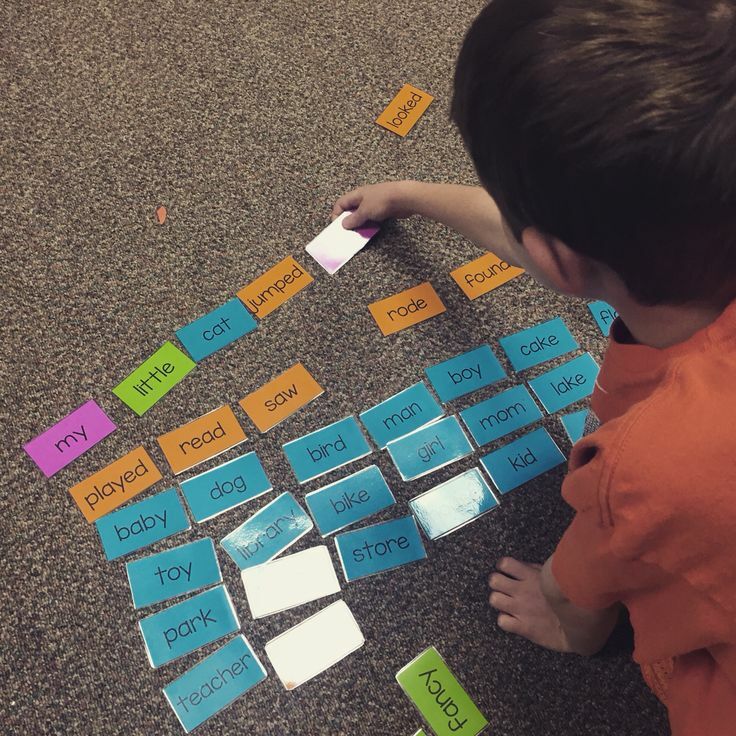 These word cards really come in handy because I allow students to choose a spot in the classroom for word work. They can bring their words with them anywhere! It is especially handy when you have classroom volunteers or paraprofessionals who work with students. I can easily send our word list with them as well. I begin by showing my students how the word lists are set up and the difference between word family words and sight words. Depending on the word work activity, I sometimes ask students to use the sight words and sometimes the word family words. Most of the time, students are allowed to choose the words from the card that they would like to work on that day. At the beginning of the year, I like to build a nice base of paper/pencil activities that the students become familiar with. 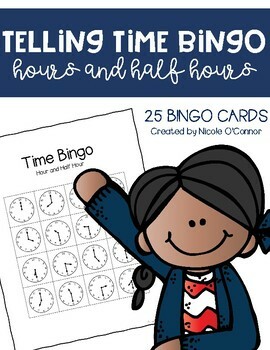 I get the activities from this AMAZING FREE RESOURCE.... I like to develop the paper/pencil tasks first because the whole class can work on them at the same time. 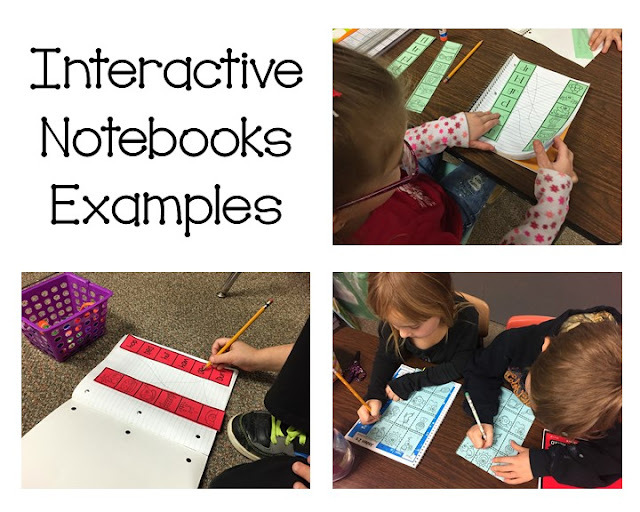 The other more paper-based activity that we start in the first few weeks of word work is interactive notebooks for phonics and word sorts. My students have a very general "reading notebook" where we put all of their phonics interactive notebook pages, reading response, etc. 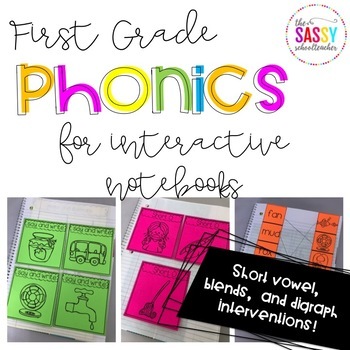 We study short vowels at the beginning of the year so I use The Sassy School Teacher's First Grade Phonics for Interactive Notebooks. Highly recommend! 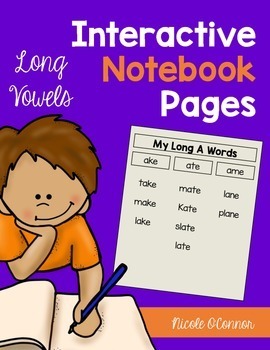 I created my own Interactive Notebook pages for Long Vowels, which you can grab here. For the first few days of work work, we continue to review the I-Chart and I have the students sit in their desks. I tell my class that when they show me that they know how to demonstrate the word work expectations, they will be allowed to choose a spot in the classroom. Usually after about a week or so, I allow students to start choosing spots- they can use clip boards and we use the arm length rule... They shouldn't be within arm length of another student in their chosen spots. After a solid month of word work, when the students are comfortable and independent with about 5-6 of the paper/pencil word work activities, I introduce our WORD WORK BOARD. 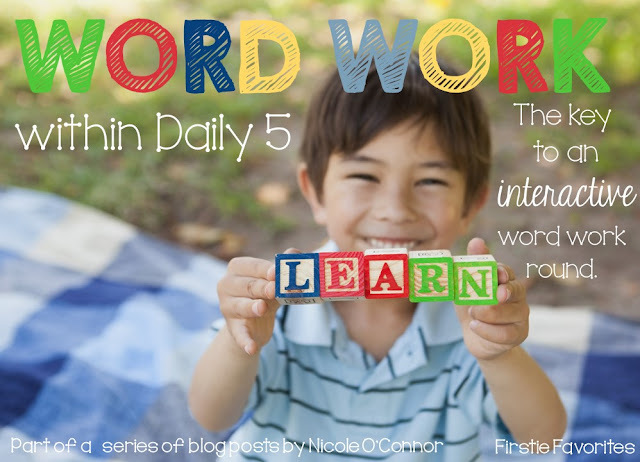 It is really important that students are familiar with the initial word work activities because this is also when I start pulling reading groups during word work so I am not as available to help with questions. From this point out, I usually introduce one new word work activity each week and the rest of the activities are things that my class is familiar with. This word work board allows me to differentiate my word work for different leveled reading groups. It also allows me to create more interactive, hands on activities because only about 4-5 students complete each center each day. Therefore, I only need five sets of beads or stamps, etc. 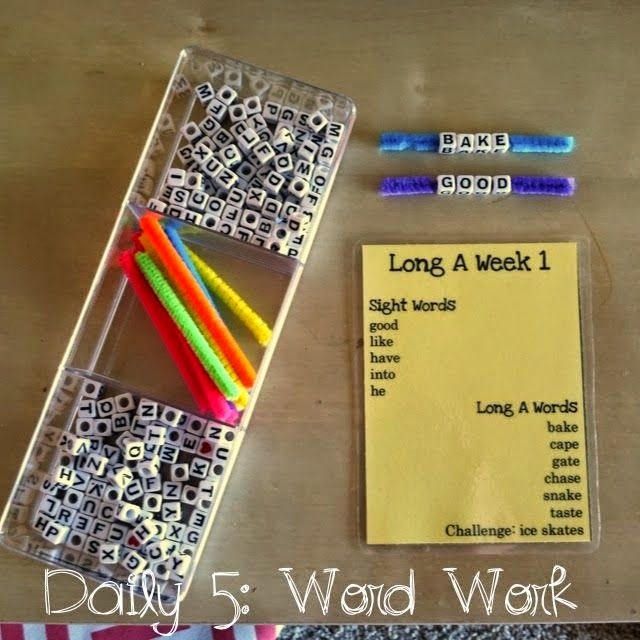 Students get to each word work activity throughout the week. Here's how it works. Every student in my class is doing word work at the same time, but they are doing different activities, depending on their assigned group. Each student in my class is assigned a color group (you'll notice on the far right, there is a little poster with each student's name and their color). The left side of the poster shows the day of the week. The top row shows the different work work options for the week. When students want to find their word work, they put their finger on the day of the week and follow it over to their color. From the color, they follow it up to the word work activity for the day. After 2-3 days of practice, students are good to go! The activities at the top of the poster are on Velcro so I can easily trade them out each week. I also have a few blank cards that I can write on with dry erase when I create a few center "on the fly." If you want to copy of these header cards, you can grab them here... they are definitely a work in progress for me since I am always adding new centers, but at least it's a start for you! I have all of the word work activities sitting on the top of one of my classroom library book shelves. I can get all of the activities ready on Monday and then I am set for the week. Okay, so that answers the question of how I set up word work in my classroom. Now comes the fun part... the actual activities!!! Here is a snapshot of a few of our favorite activities. I blogged about each of these activities a few months ago so click this link to read about them : WILD ABOUT WORD WORK! 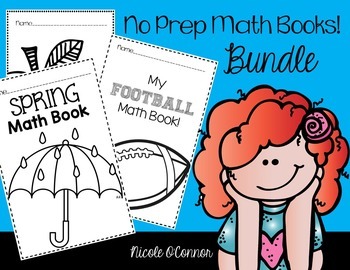 LOTS of freebies here! 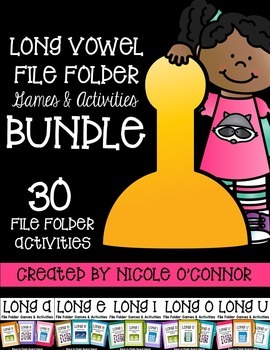 Okay, here I'm just going to start posting some links to activities that I use for word work! 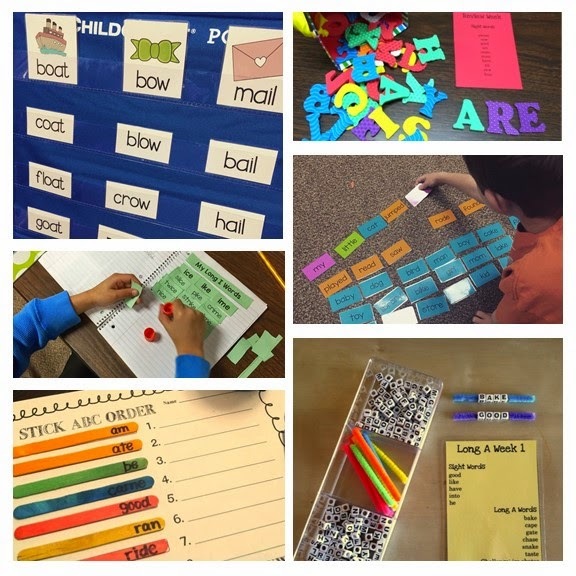 I recently began making sets of literacy centers for each month of the school year. 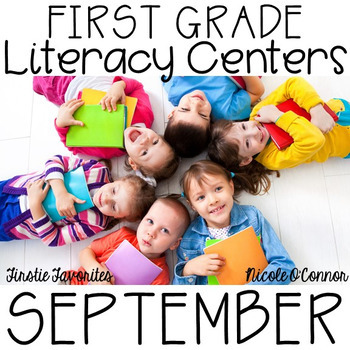 Here's a link to my September centers! 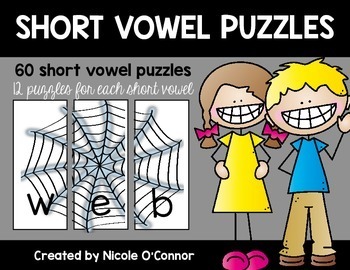 Short Vowel Puzzles: grab them here! Sorting words in Pocket Charts: My students complete this as a small group! 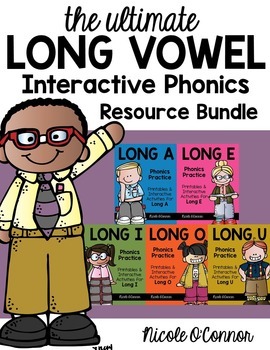 Link here to the Long E Freebie! 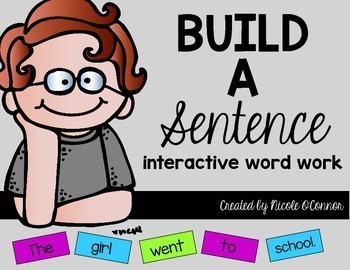 Build a Sentence Word Work.... My students LOVE this one! One element that I am adding to my word work this year is an interactive word wall... This is a very new creation for me and I don't even have it set up in my classroom yet. I cannot wait to use it this year!! The word wall will have student names and our sight words that we learn throughout the year (our students are required to spell the First 100 Fry words). Along with the sight words, I am going to include some Word Family Posters that I am going to have students create with me. I will also have additional activities that students will complete at the word wall for one of our word work centers. Here's a sneak peek at my resources. Each time I introduce a new word family. 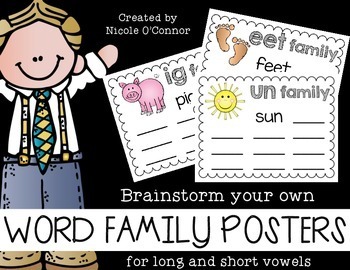 I plan to have my students help me brainstorm word family books to add to the word wall. I'm going to laminate these posters so that I can write on them with Vis-a-vis or dry erase markers. 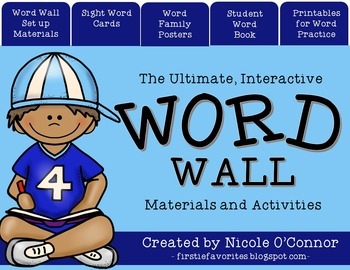 Grab my word wall materials here: Ultimate Interactive Word Wall Materials and Activities. The word family posters can be bought separately from the word wall complete set by clicking this link. 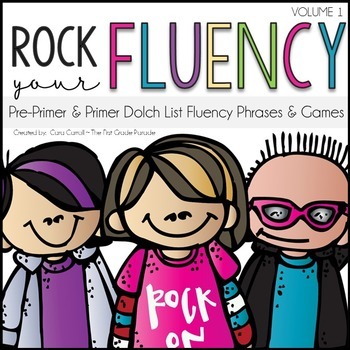 I also use Cara Carroll's Rock Your Fluency materials as part of my word work centers!! 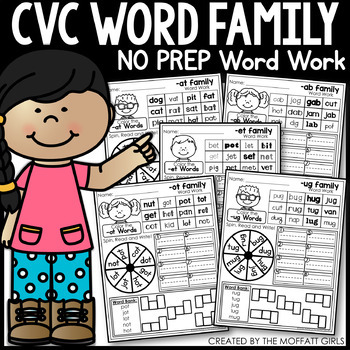 The Moffatt Girls' CVC Word Family Word Work. 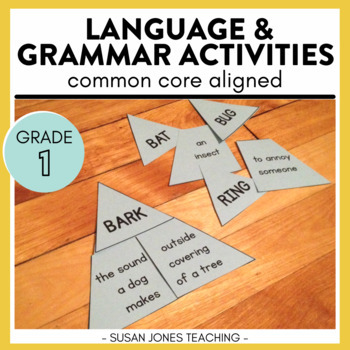 Susan Jones' First Grade Grammar Activities and Printables!! So many fun, interactive activities in here! 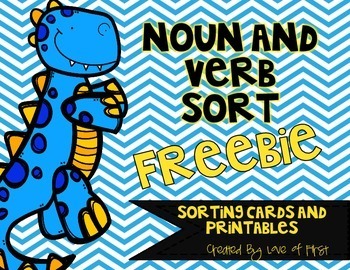 Love of First's Noun and Verb Sort Freebie! Okay, I know that I just totally overloaded you with links but I highly recommend checking them out. Thank you for stopping by to read about how I set up word work in my classroom. I hope that you found some good ideas to take with you! 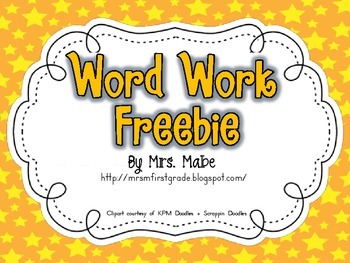 If you have word work activities to share, please post a link to your own blog post or TPT products in the comments section of this post. I'd love for it to be a collaborative collection of ideas from myself and other teacher readers!! On to the next post: Work on Writing! Girrrrrl! I JUST got around to reading this post and I am SO FLATTERED that you posted one of my products! You are officially my home slice! 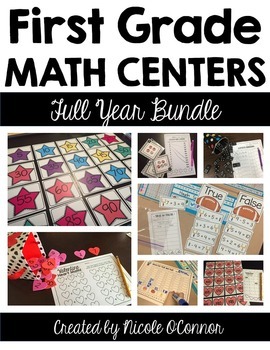 You have the best ideas - your classroom looks like so much fun!